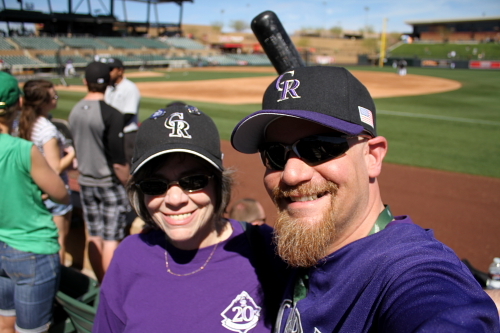 Rockies split a split sqaud double header. So once again the day started early first I got up before 6 and started the post from the day before than I had to get ready to get to the stadium and got there probably a little after 9. 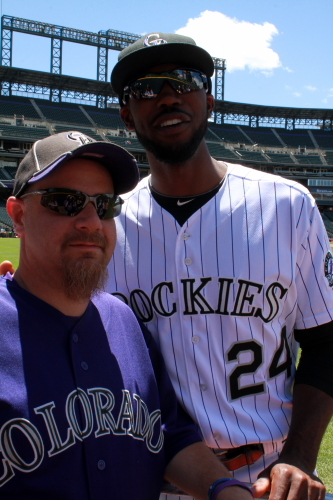 I met up with EB who only need 1 person to get to sign a baseball to get the 40 man roster and I am not sure who he needed!!!!! 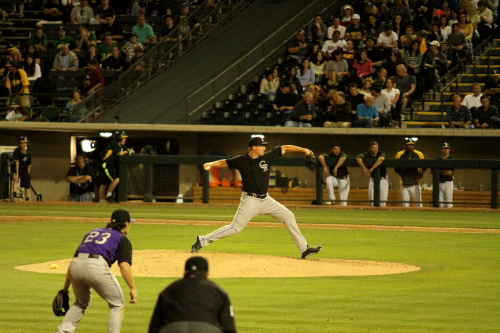 I think it was Jorge or Jhoulys or some possibly Boone Logan not quit sure! 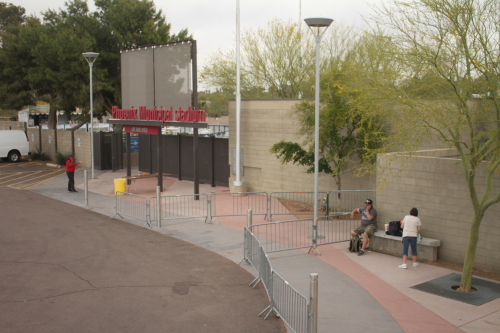 Mary was hanging out before work and took a photo next to the fence she has been asking for since Salt River Fields opened in 2011. This year the added it! We now call it Mary’s fence! The pitchers were out throwing some bullpens that is Christian Friedrick and Boone Logan on the mound. The Rockies this year are having and autograph table on the concourse the signers today were Dustin Garneau and Rex Brothers. 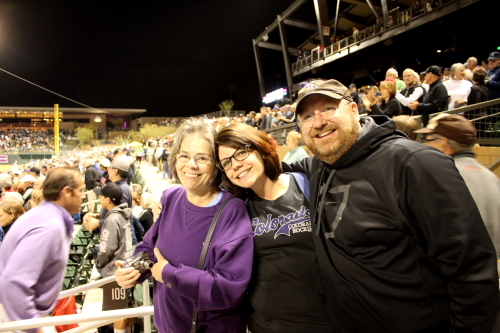 Today Jared and Rachel were at Salt River Fields the came down yesterday and was at the Rockies vs. Cubs. Here is a photo of Jared with Mom. 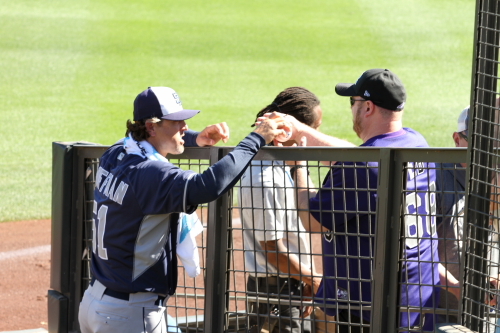 It was an OK day for autographs here is Charlie Blackmon signing. Since one of my awesome friends got me a autographed ball this year! 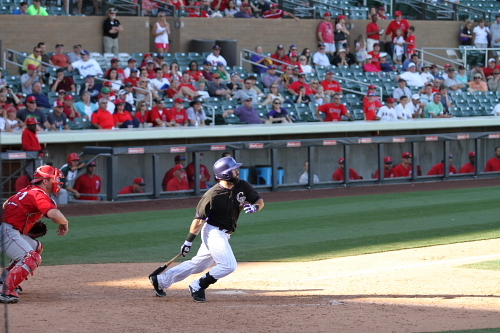 So Phillips lead off by grounding out to 3rd. 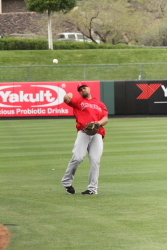 Than Ramon Santiago hit a single. 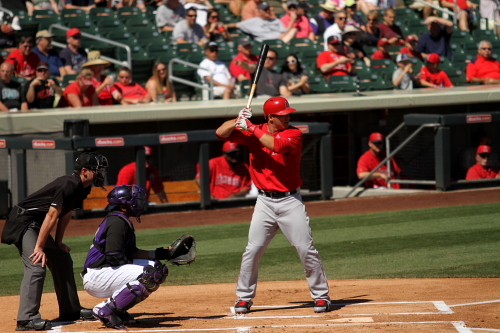 Anderson than struck out Joey Votto followed by Ryan Ludwick grounded out. Mike Leake was the starting pitcher for the Reds. 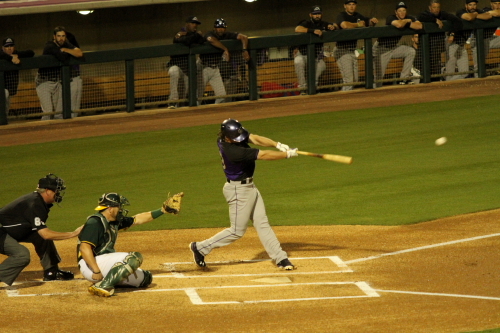 Charlie Blackmon grounded out by hitting back to Leake. 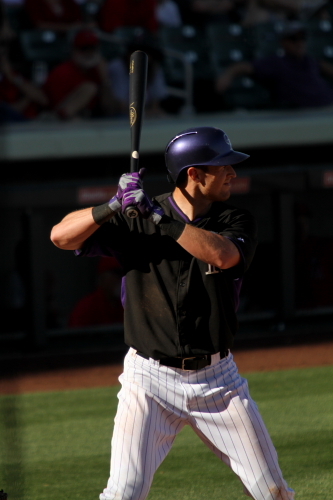 Charlie Culberson got on base by hittin a single. 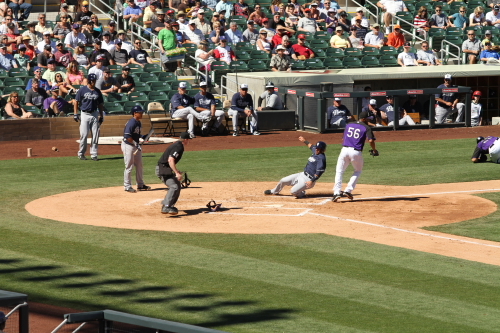 Michael Cuddyer would fly out to right and the inning would end when Culberson did not get back to first and ended the inning for the Rockies. 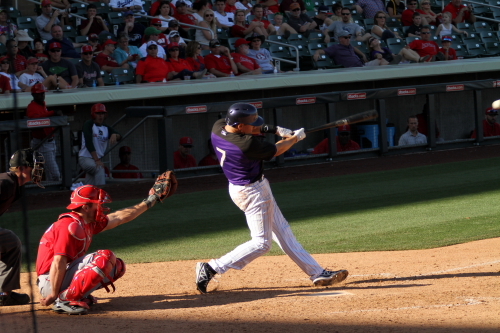 Matt McBride trying to leg out a hit during his second inning at bat. he was the second out of the inning. 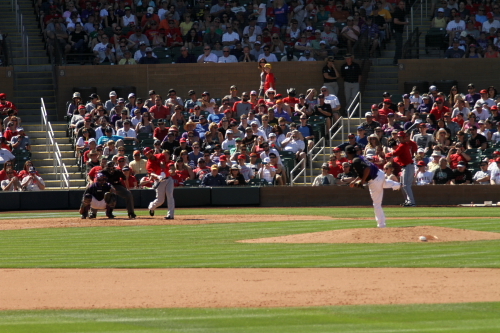 Josh Rutledge taking a pitch for a ball during his at bat. 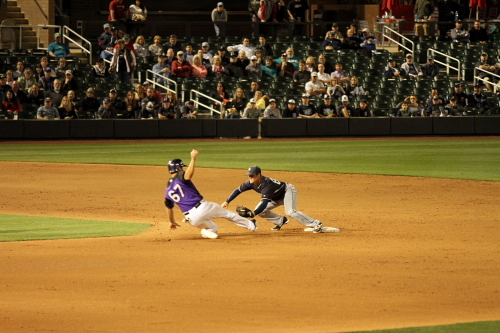 Jason Pridie takes a lead off second base he was the only Rockies runner in the second inning. 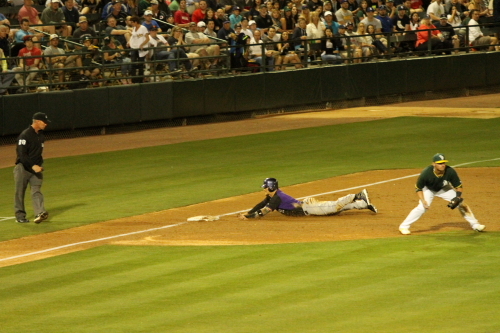 Josh Rutledge also trying to leg out a hit during his 2nd inning at bat. He was out and ended the inning. 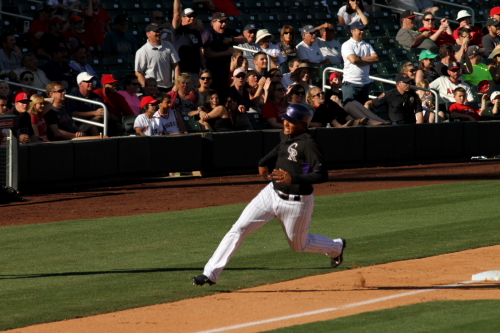 The Rockies score their first run in the 3rd inning. 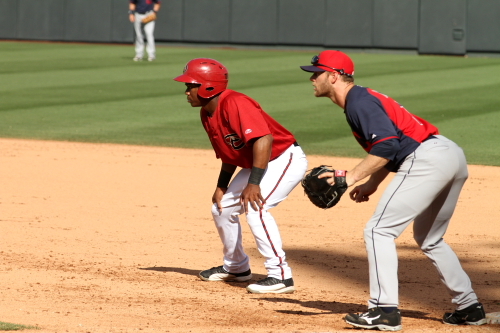 D.J.eMahieu lead off the 3rd with a walk and scored on a Charlie Culberson double to left. 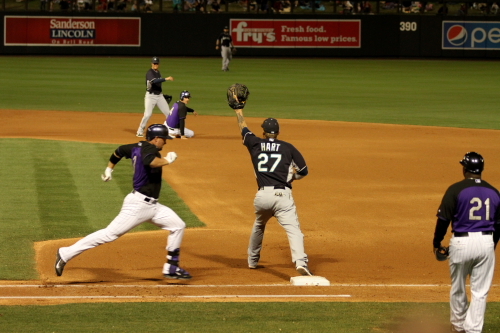 This run tied the game at 1. 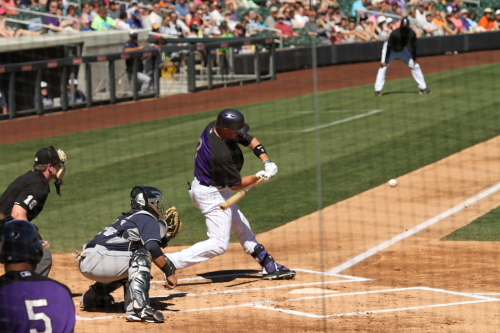 The above is a photo of Michael Cuddyer taking a swing that ended up flying out to center field to end the 3rd inning. Sam LeCure was the second pitcher of the game for the Reds he pitched the 4th inning for them. Louisville Bats Legend Corky Miller in the 7th inning. 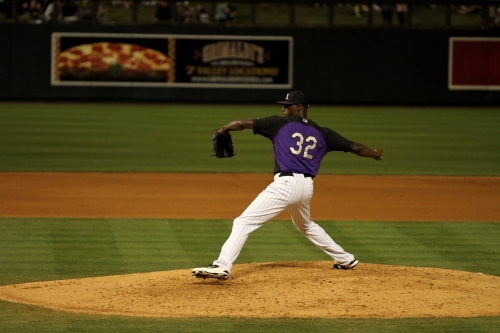 I saw that somewhere I did not make up the Louisville Bats Legend! I have seen him play in Louisville 2 years ago on my road trip. He grounded out in the inning. Jordan Pacheco field a softly hit ball by Roger Berndina for the second out of the 7th inning. 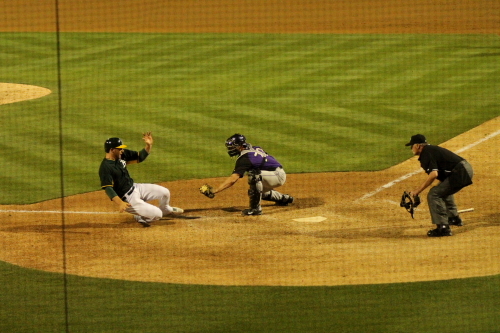 Matt McBride makes the grab at first for the Berdina out. 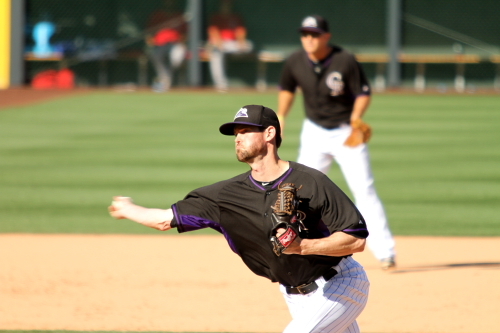 Adam Ottavino pitching in the 8th inning. 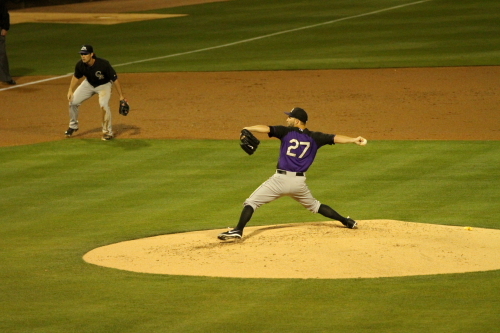 Tyler Matzek came into the game to pitch in the 9th inning. 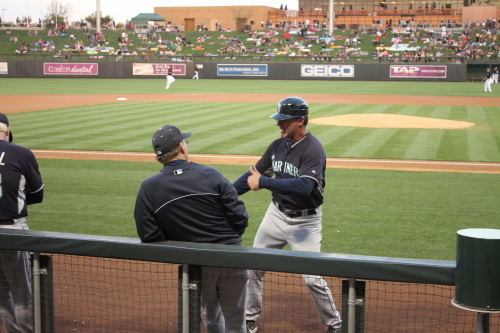 The first batter he pitched to and walked was Chris Nelson. 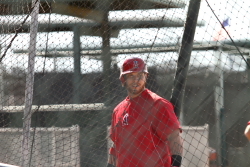 Nelson is an invitee for the Reds this year after being with the Rockies, Yankees and Angels last season. 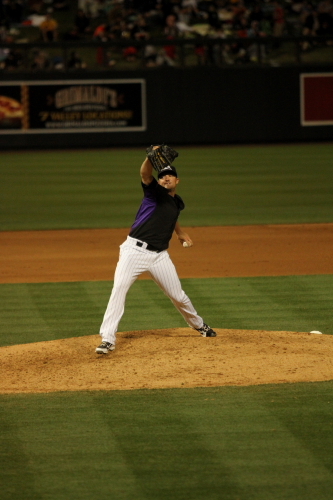 Matzek walked 4 consecutive batters the third batter he walked was Louisville Bats Legend Corky Miller! OK that is it for the use of that dead horse! After the 4th walk which scored Nelly for the Red second run of the game. 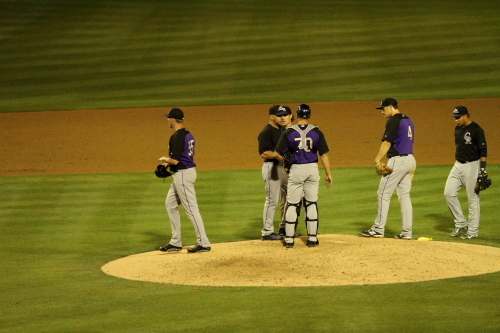 Matzek was than removed from the game. He has been known to have control issue through his Minor League career, But when he is on he can be totally lights out. Not this day. 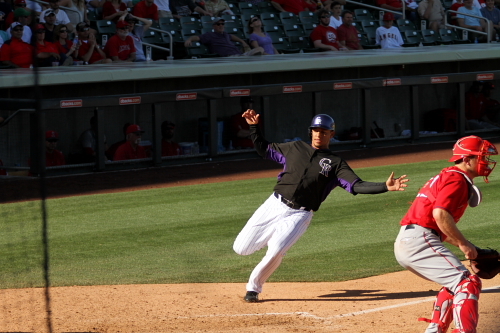 The Rockie got out of the inning with a double play. 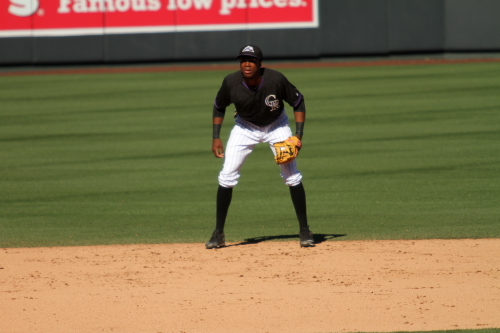 Here is Rosell Herrera turning the double play at second. 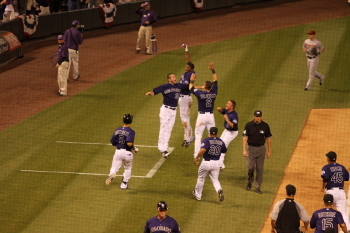 That was the end of the game and the Rockies won this one 3-2. 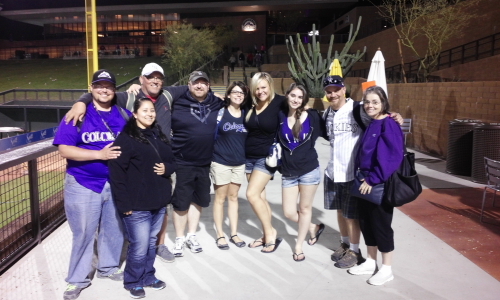 After this game we had to leave the stadium and get ready for the second game of the day at Salt River Fields. 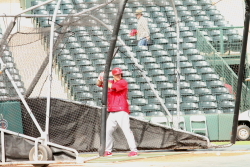 Between games I headed to the Diamondbacks side to watch their batting practice. 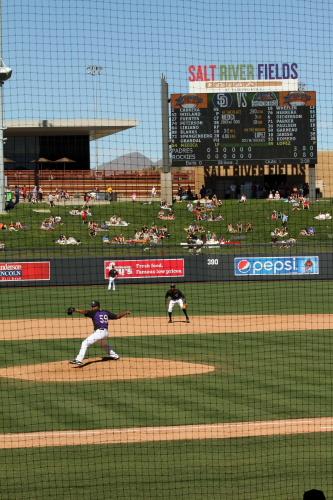 I go to that side because there major league practice field is more accessible than the Rockies side. After dropping my bag off I headed back to my car to get some stuff for the Diamond backs to sign. Along the way I found and Easter egg. That was the 4th ball of the trip. I got back just in time for the end of the Diamond backs BP and was able to get Marc Trumbo to sign a card and Martin Prado. After meeting back up with EB we headed back into the stadium. 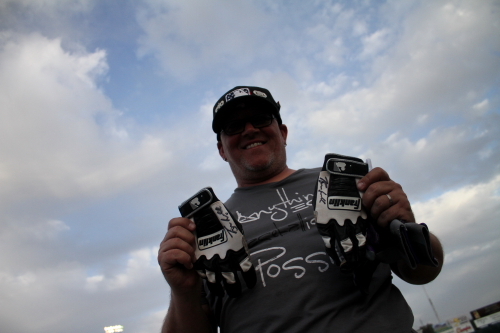 Before the game I was able to get some more autos on my team project and in my Spring Training magazine. 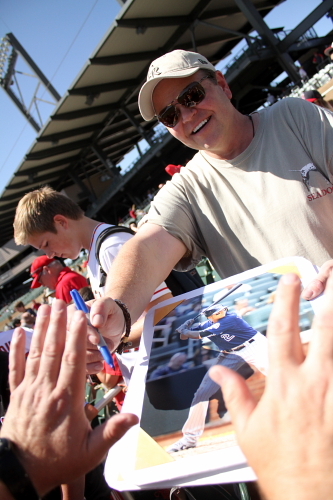 The signers on the concourse were Mike McHenry and Gregg Burke. I had McHenry sign a locker tag that I got at Fanfest from last year when he was with the Pirates. 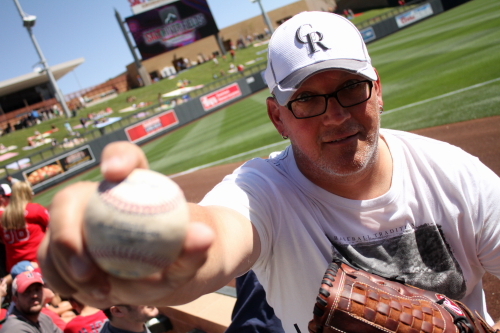 I was also able to get Nolan Arenado on a ball that he tossed up last year that I caught during warm ups. 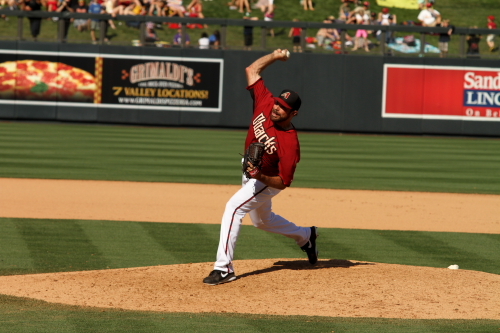 The Second game was against the Diamondbacks. I did not really take many photos this game I think I took a total of 31 photos the whole game slightly because I was tired and second every now and than I just want to hang out and watch a game which is what I may try to do this year every few games so may not be posting every game I am at this year. 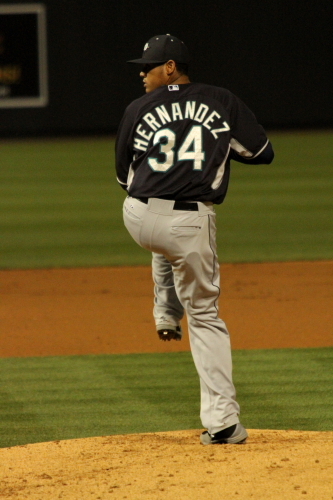 Pedro Hernandez was the starting pitcher for the Rockies. 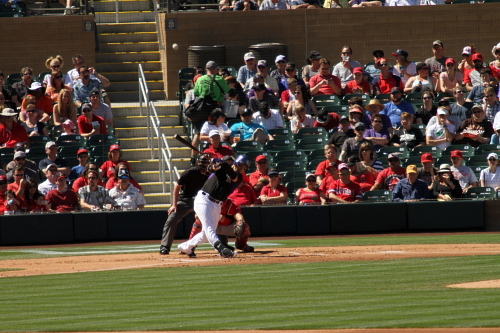 He allowed 1 hit in the 1st it was a double by Aaron Hill. 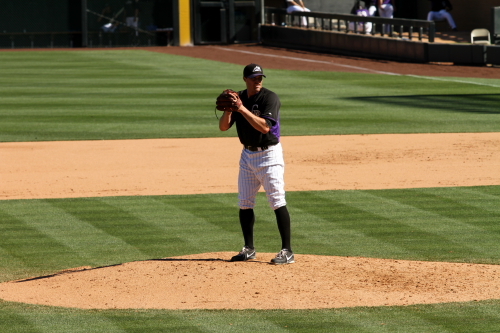 Wade Miley was the starting pitcher for the Rockies. 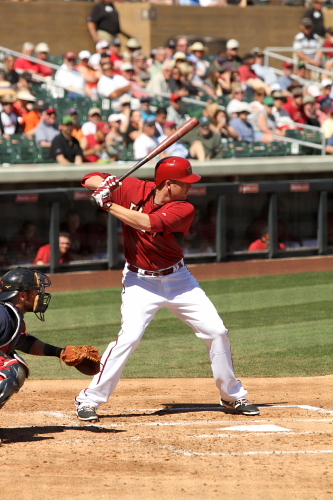 The Diamondbacks got on the board in the 3rd inning with a solo shot by Aaron Hill. They scored a second run in the 4th inning. 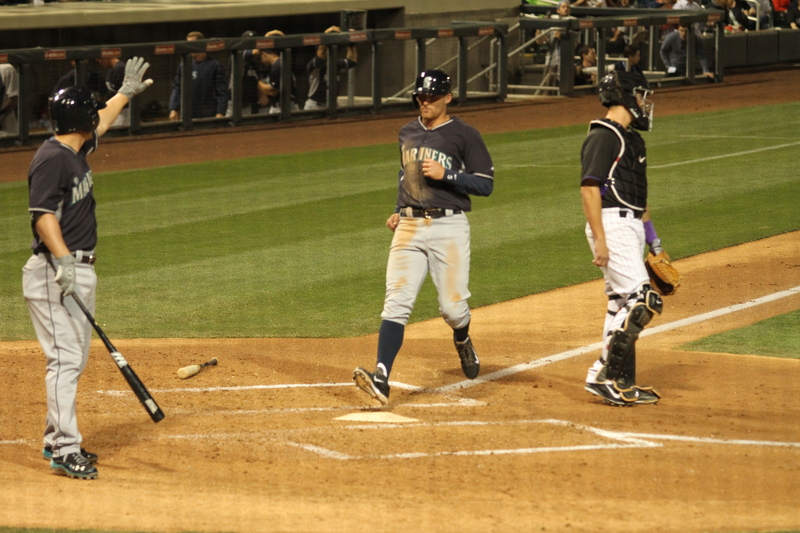 Martin Prado scored on a Chris Owing single. 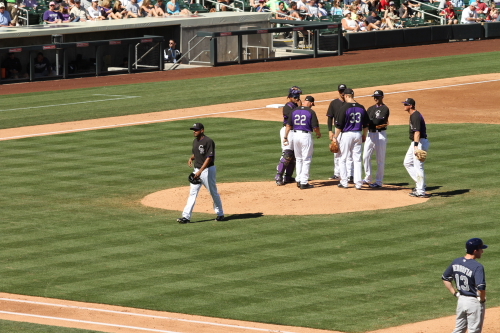 Tulo leaving the game after being hit by a pitch in the 4th inning. He left the game because his pride was hurt and sent for X-Rays and they have came back negative, negative for a heart, brain or personality! 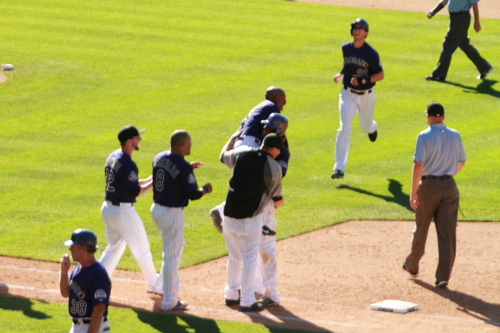 The Rockies first run came in the 5th inning when Michael McHenry hit a double scoring Paul Janish. putting together this post for 3 hours and need to get functioning! 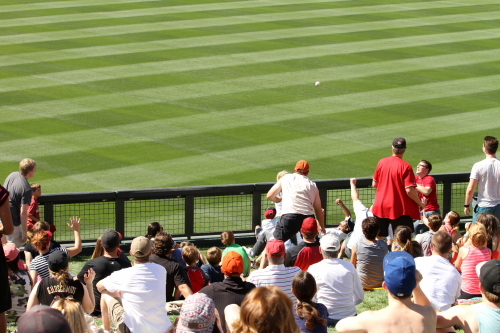 Another great day at the ballpark. 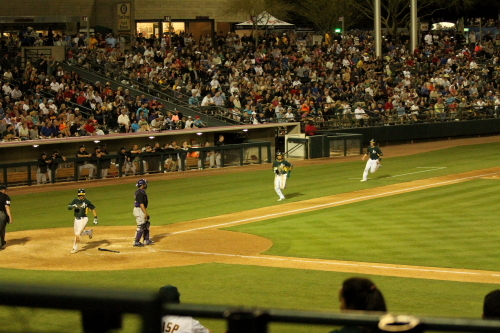 The next game will be at Phoenix Municipal when the Rockies play the A’s. 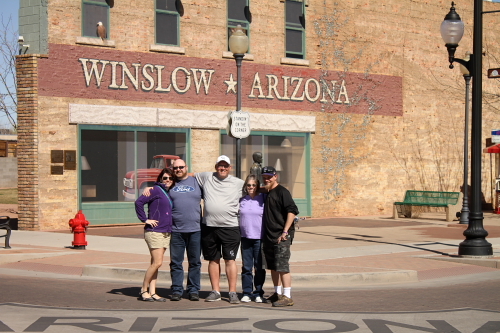 See you around Phoenix halfway through this trip! Sell outs and shuts for day 2. 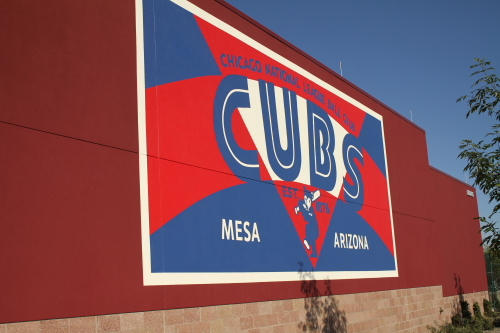 So today we started off at the Cubs new Ballpark in Mesa. 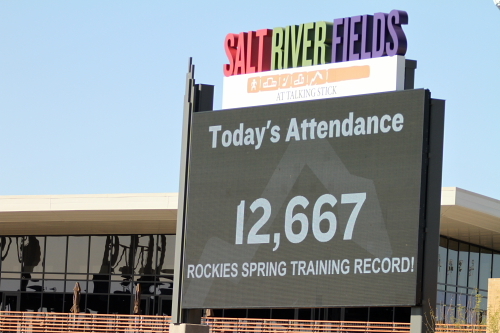 The Rockies were there so I arrived early to check out the complex and see if I could snag some baseballs or get some autographs. While walking from the parking lot to the practice fields which are past the stadium from the parking lot. 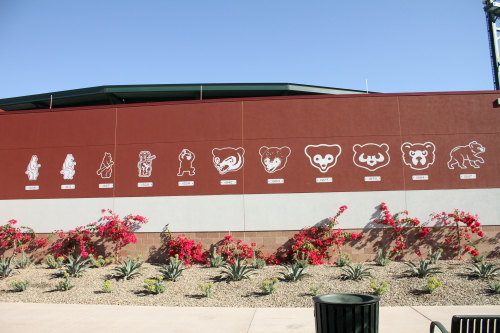 I took some photos of the outside one display showed the different Cubs logos. Others were of baseball cards of recent players. This is the clubhouse. It is a free standing building. 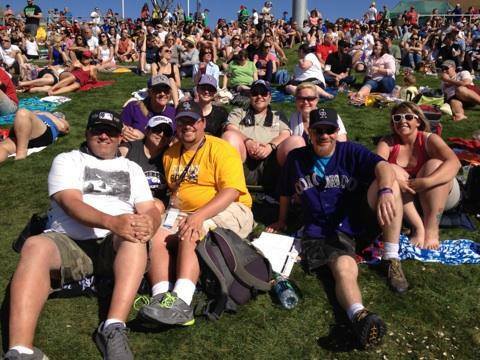 It is a couple of hundred feet from the stadium. 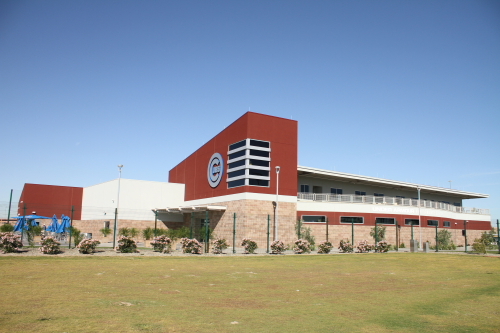 the practice fields are on the opposite side of this building from the stadium. It is very spread out here and it takes a little walk from the parking for the stadium to get to the practice fields. 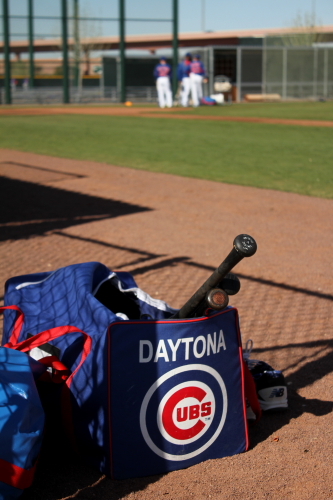 Here is a look at the minor league training area. 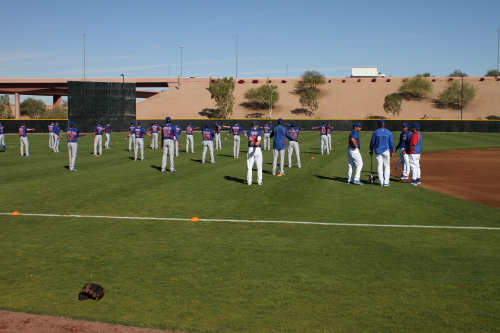 Some players doing some stretching. 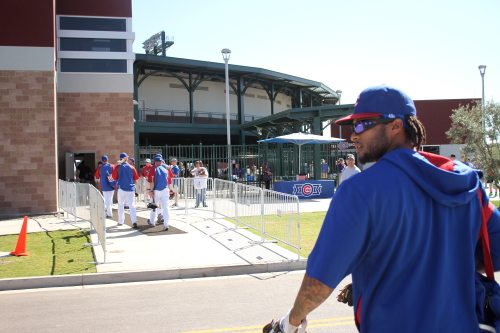 I like being on the minor league practice fields because you get really close to what is going on. You can get some detailed shots outside the actual game. 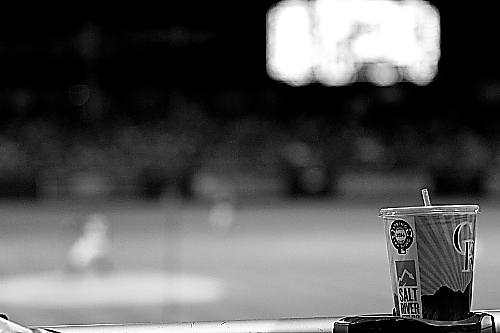 Like this creative BnW to show off the mad photo skillz! 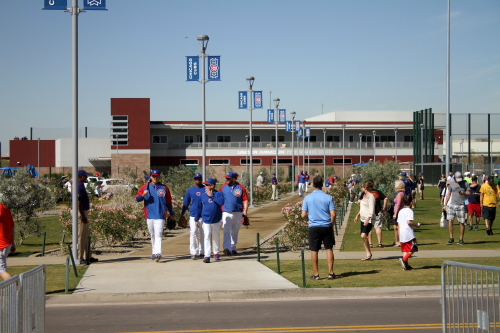 The players walk from the clubhouse to the stadium. After checking out the complex I headed over to get tickets for the game and it was completely sold out. So now to figure out what to do. 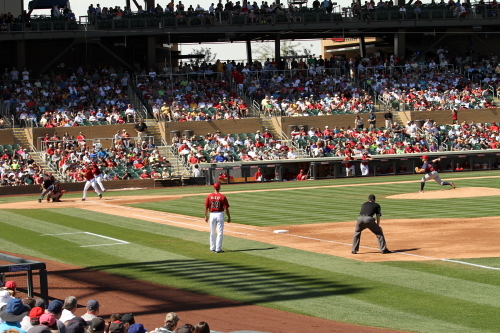 I figure well this stadium will be here a bunch of years and I will most likely be at spring training again. So I had to figure out a new plan. 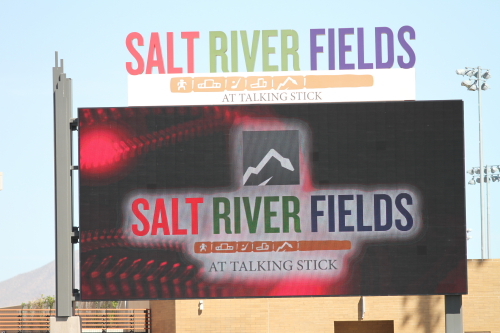 So I decided to head to Salt River Fields at Talking Stick and check out the Diamondbacks game they were playing the Indians. So when I headed over to the ticket window there it said there were only lawn tickets left which was fine because that’s what I always get. This whole season has been very busy for the stadiums and they have been having very good crowds. I have not seen this in previous years at any stadium. Especially for day game during the week. So onto the Indians Vs. the Diamondbacks. 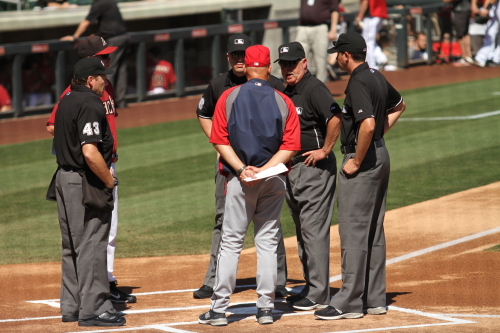 Here is Indians manager and Terry Francona exchanging lineups and talking to umpire Jim Joyce. 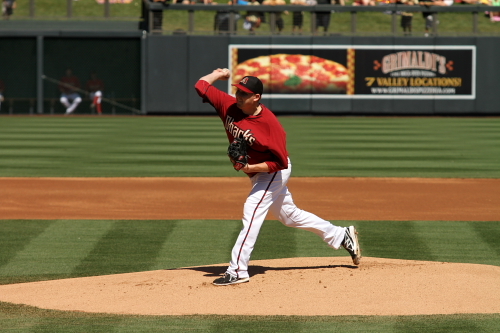 Trevor Cahill was the starting pitcher for the D’backs. 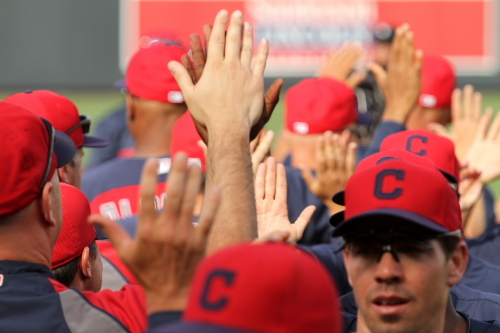 The Indians Michael Bourn lead off the inning with a single followed by a single by Asdrubal Cabrera. 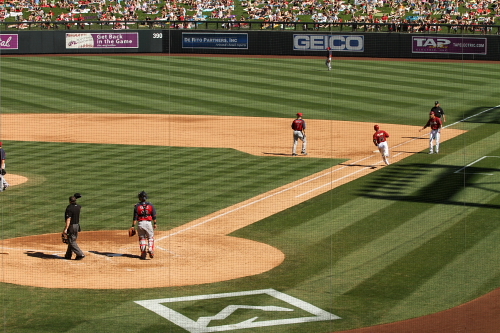 Jason Kipnis hit into a double play getting Cabrera out at second and himself out at first. 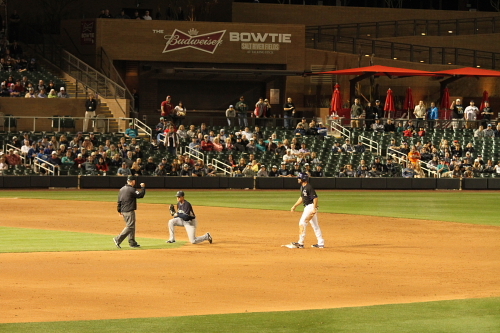 Bourn advanced to third. Michael Brantley flew out to end the inning for the Indians. 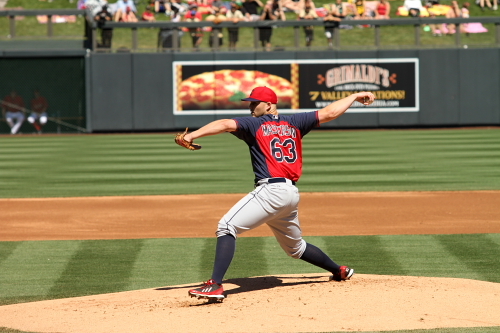 Justin Masterson was the starting pitcher for the Indians. 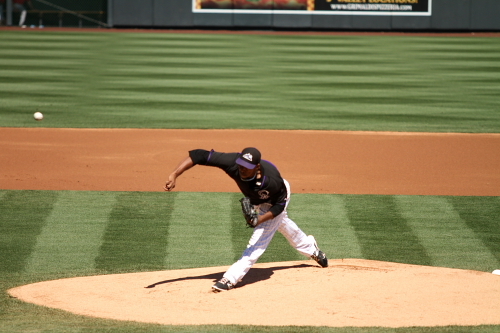 He got out of the inning throwing three pitchers, Wow first pitch swing D’backs! He would pitch 4 and 2/3 inning only allowing 2 runners both hit by a pitch. The Indians would score the first run of the game in the 3rd. 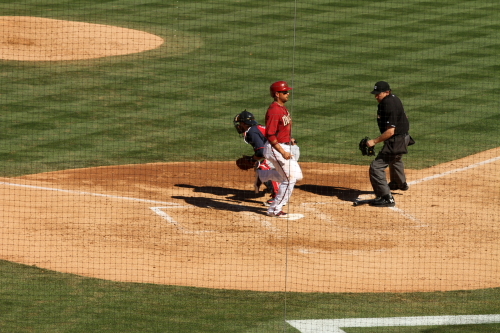 Yan Gomes scored on a David Adams sac fly to right field. 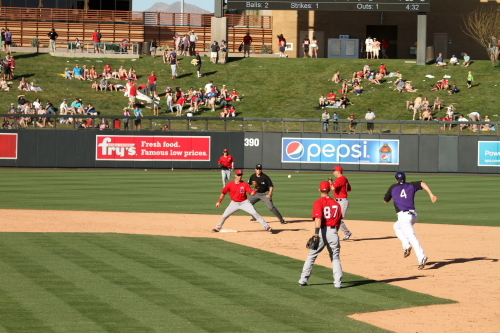 Which resulted into a double play getting Jeff Francoeur out at first because he did not tag up and that ended the inning. 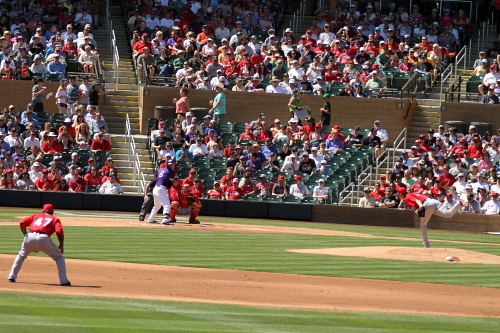 Mark Trumbo batting in the 2nd inning for the Diamondbacks. He went 0-3 striking out twice in the game. 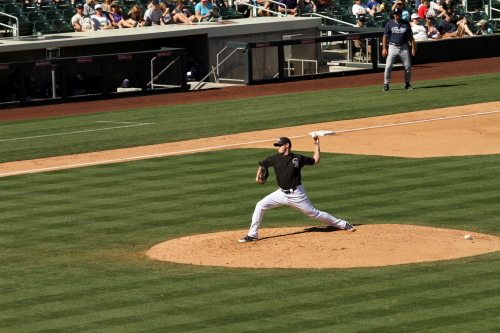 Masterson pitching to Shelley Duncan in the 3rd inning. 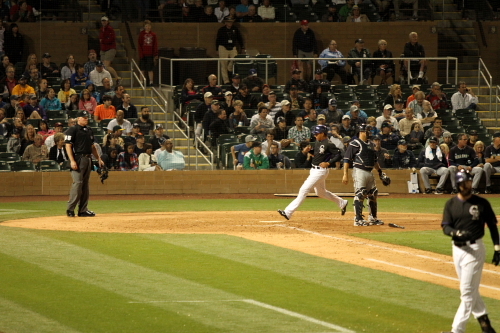 He was the second batter hit by Masterson. 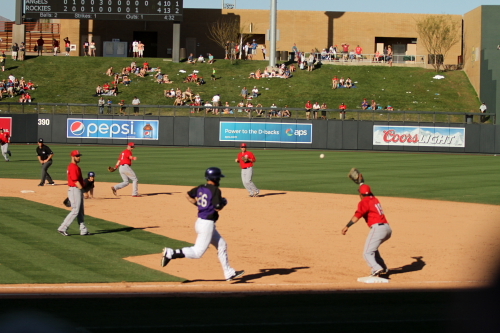 He would get out trying to steal second during Matt Tuiasosopo at bat. Lonnie Chisenhall hit a 2 run home run this is the ball going out in right field 3-0 Indians. 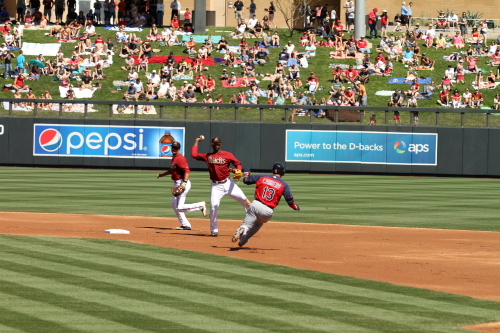 He would eventually score the D’backs first run on a Tuiasosopo single. 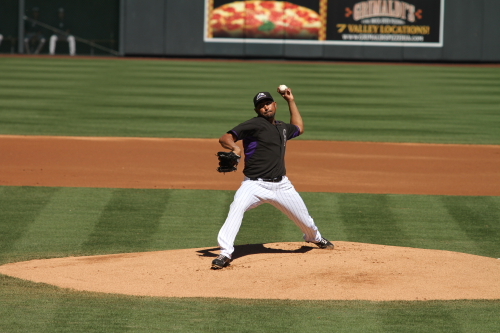 Josh Collmenter pitching for the D’backs in the 8th inning for the D’backs. 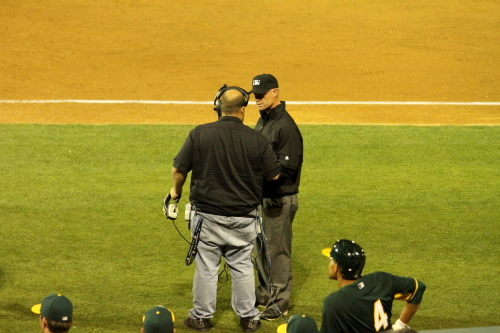 I believe this is Chuck Taylor taking a lead at first after walking in the 5th inning. The Indians would score 2 more runs in the 9th and win the game 7-1. This was a pretty good game with very good pitching by the Indians and 4 no hit inning (except the hit batters!) by Masterson who was announced as the Indians opening day Starter. 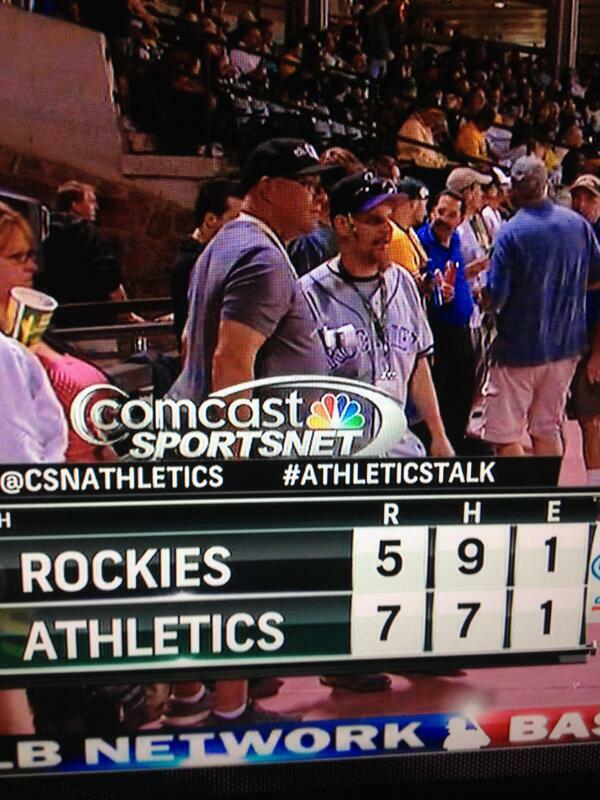 So as I was watching this game the Rockies shut out the Cubs 13-0 and hit 4 home runs. 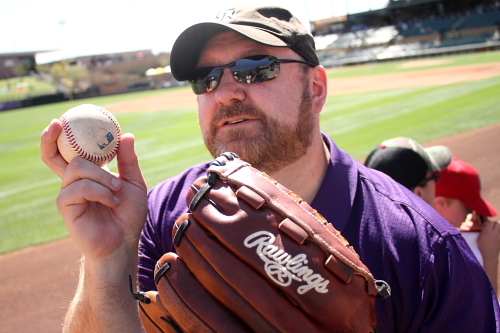 Also if any body is wonder I got 3 baseballs Monday night at the Diamondbacks batting practice on the practice fields, 1 catch, 1 roller and an Easter egg. I had2 of the autographs by Marc Trumbo and Archie Bradley. Bradley is a very high prospect in the Diamondback organization and is rank as the 25th best prospect in all of baseball. Well that is it for day 2. 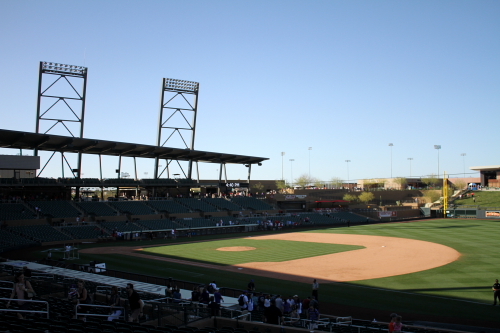 Day 3 I will be back at Salt River Fields at Talking Stick for possible 2 games as the Rockies have a split double header. 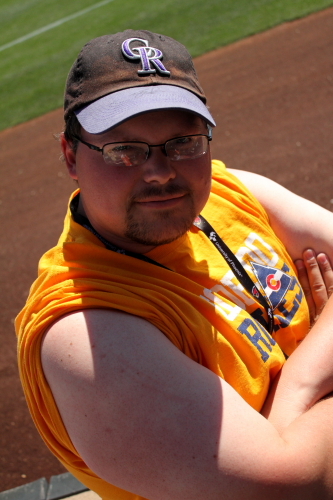 I will definitely be at the day game still pondering the second. 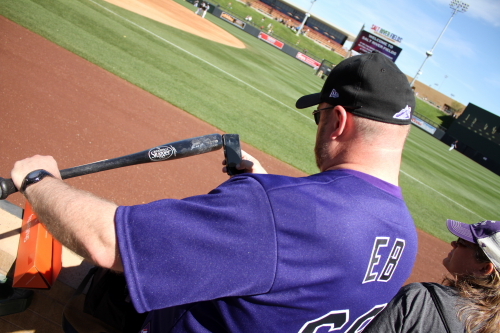 Dusting of the keyboard and defrosting the fingers gearing up for 2014 Baseball! 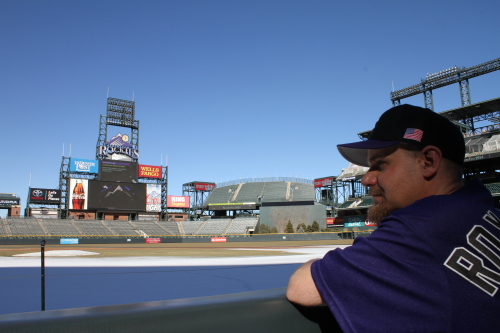 As I sit here on a warm Denver afternoon at the beginning of March, I can only think of one thing at this time next week I will be sitting in Salt River Fields at Talking Stick watching the Rockies. I did not do posts this off season, to take a little break I did do all my normal off season activities like snowboarding and was at the opening day for the season at Keystone and Breckenridge. I have 15 days on the slopes so far this year. I did attend the Dew Tour like I have in the past. 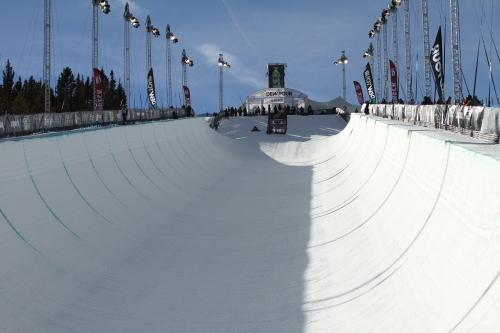 This is a look up the Half Pipe at Breck. 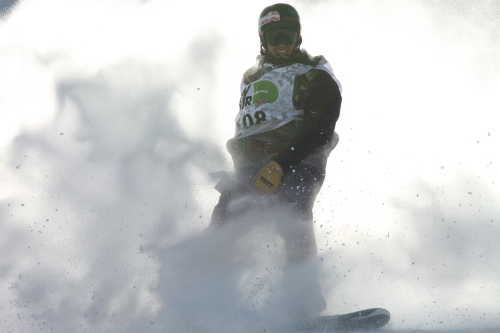 Here is a look at a competitor after his run on the slope style course. 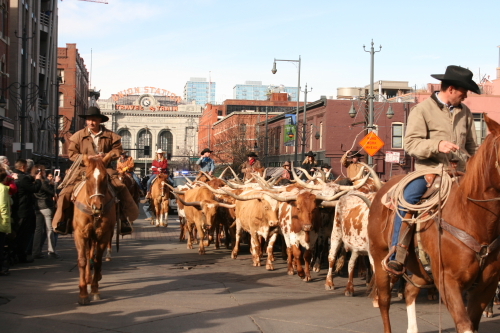 I also attended the National Western Stock Show Parade. 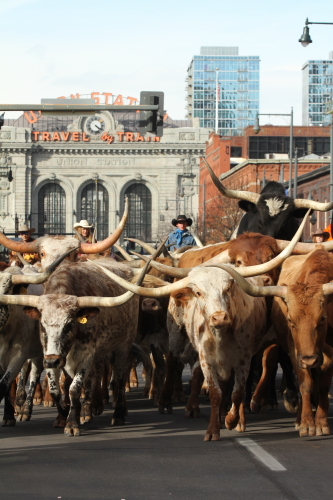 Always trying to improve on my long horns heading down 17th street photo. I think this year I may have gotten the best ones yet! This Off season we said bye to Dex, Jonny and Drew. 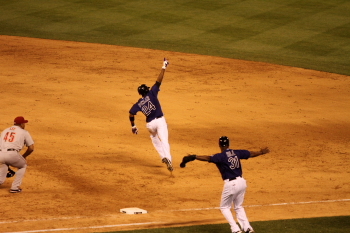 Going to miss moments like this from Dex! 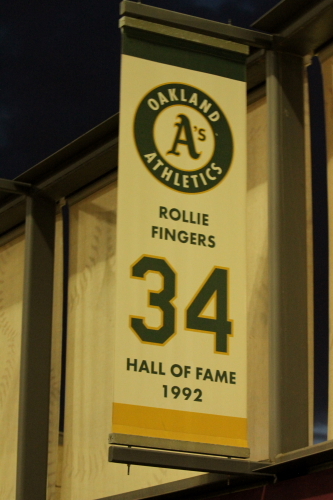 Guy had a tendency to get the hits when the game was on the line. 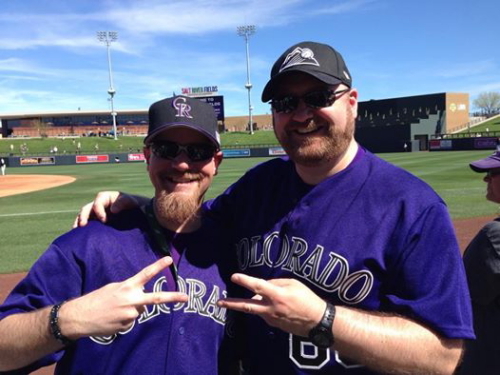 Yes, I also did get to fan fest this year got to meet some of the ne guys like Justin Morneau and Brett Anderson both were very cool to talk to and seemed ready to try and help the Rockies this season. 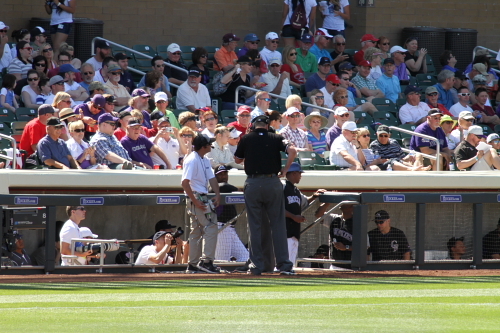 Hopefully Morneau will return to his ways of his MVP year and can get things working here at Coors. 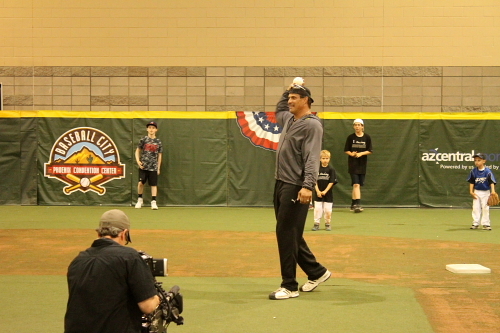 I was asked what would he needs to do to help the team and to make up for the retiring of Helton and I said he needs to hit 25 plus homers with close to 100 RBI’s, bat in the high 300’s, hit timely and get those extra base hits like Helton had. Especially the doubles. 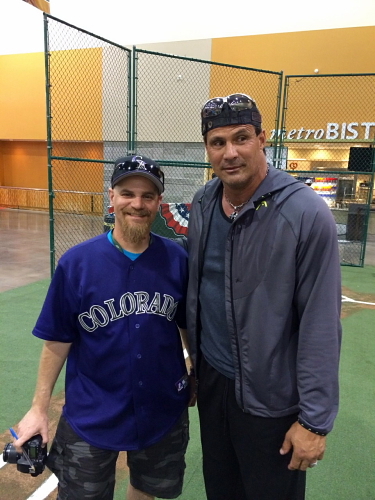 I asked Brett if he was ready for the pitching challenges that Coors is known for and he said he is a ground ball pitcher and as long as they stay on the ground everything should be alright! Hope everything works out for him, he seems really cool and if everything pans out well with him I might finally give an answer to the Ubaldo trade! 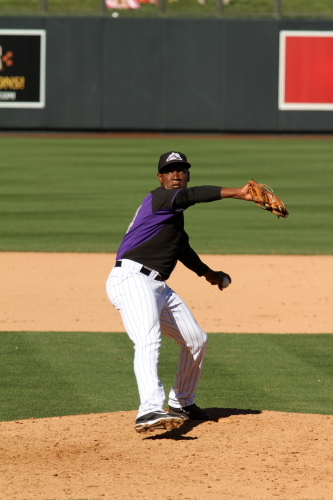 Since we got him for Drew Pomeranz who did not work out that well for the Rockies since he came to us with others for Ubaldo. So I will be in Phoenix from March 10th to the 16th. I will be at the Game on the 10th against the Padres. 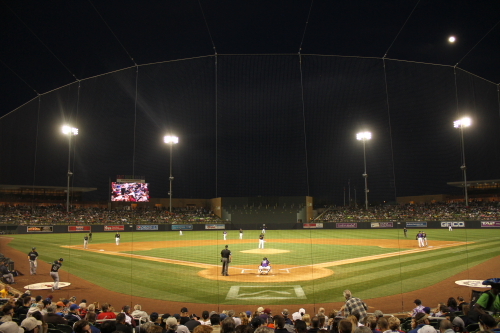 I will also be checking out the new Cubs stadium and seeing the Rockies at Phoenix municipal when they play the A’s. 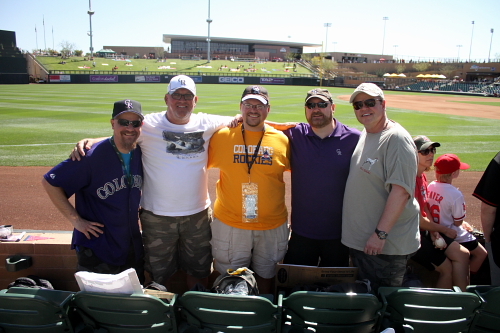 I am also starting to plan the 2014 baseball adventure I am thinking possibly Chicago and Detroit this year for Rockies games and plenty of minor league baseball in-between including the 2014 Triple A All-Star game in Durham this July. 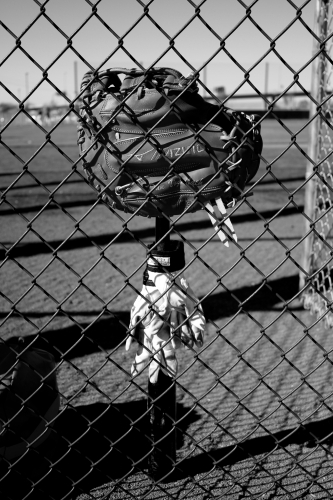 So I am ready for baseball how about you! 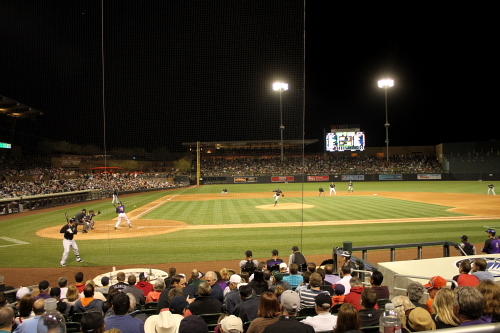 See you in Phoenix and if not at Coors for the 2014 Season. I can’t wait it should be a interesting season. Hopefully it will be filled with awesome memories and great friends!! !